Western Montana Water Users attorney Brian Shuck presents a point for District Judge C.B. 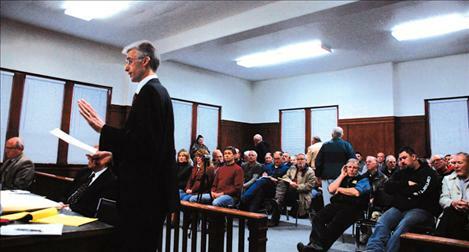 McNeil to ponder during a jam-packed hearing on Feb. 14 at the Lake County Court house. Attorney Jon Metropoulos represented the Flathead Joint Board of Control and the irrigation districts. POLSON — “Whiskey is for drinking, and water is for fighting” says an old cowboy platitude, and the latest “fight” took place in Twentieth District Court Judge C. B. McNeil’s courtroom on Feb. 14. McNeil heard arguments from plaintiff attorney Brian Shuck representing Western Montana Water Users, LLC., and defense attorney Jon Metropoulos, representing the Flathead, Jocko and Mission irrigation districts and the Flathead Joint Board of Control. McNeil promised a speedy decision and was as good as his word when he handed down a Feb. 15 finding that the Flathead Joint Board of Control and the irrigation districts are under his court’s jurisdiction. They have “no ownership interest in any water rights which are individually owned by irrigation members,” McNeil’s brief said. The FJBC and the irrigation districts also can’t enter into an agreement, which provides for assignment of irrigators’ water rights to the tribes. Rancher and WMSU director Steve Killorn from St. Ignatius said he guessed the crowd in the courtroom as 70 percent WMWU supporters and the other 30 percent opponents. At a hastily-called WMWU meeting on Saturday, Feb.16, at the Ronan Performing Arts Center, Shuck, a Cheyenne, Wyo., attorney, spoke a group of about 200, some WMWU supporters and some in opposition. “Yesterday, we feel the court did the right thing,” Shuck said. Local farmer Jack Lake said he believed farmers would compete for water in the adjudication. Judge McNeil is basically saying you can’t give people’s individual water rights away without some kind of compensation, Laskody added. Also present at the meeting was State Senator Verdell Jackson, R-SD 5. Jackson carried a bill at the Montana State Legislature to extend the sunset date on the Reserved Water Right Compact Commission for two years.